The Ironman is a particular type of triathlon, an endurance competition involving swimming, bicycling and running. In an Ironman competition, participants must swim 2.4 miles, bike 112 miles and run 26.2 miles in 17 hours. The courses vary from race to race, and participants may face steep climbs, fast downhills and sharp turns. You must complete the bicycle section of the race quickly enough to remain competitive in your age group, but not so quickly that you do not have the energy reserves to complete the running segment. Men who won their divisions in the Ironman New Zealand had average bike speeds ranging from 14.09 mph for Yoshimori Hirai to 23.74 mph for Cameron Brown, as of March 2011. Women who finished in the top 25 for their divisions had average bike speeds ranging from 15.99 mph for Tiare Lund to 21.63 mph for Samantha Warriner. In October 2009, men who completed the Ironman World Championship had average bike speeds ranging from 14.53 mph to 22.83 mph. Women who completed this race had average bike speeds from 15.80 mph to 20.62 mph. Physically challenged participants completing this race had an average bike speed of 18.53 mph. Men who completed the Ironman Canada in August 2009 had average bike speeds from 15.5 mph to 22.46 mph. Women had speeds from 14.5 mph to 20.74 mph. In competition like the Ironman World Championship, you must complete the entire race in 17 hours. You must complete the swimming segment within 2 hours 20 minutes after the beginning of the race, and the bicycle segment within 10 hours 30 minutes from the beginning of the race. If you need the maximum time allowed to complete the swimming segment, you must complete the bicycle segment in 8 hours 10 minutes to remain in the competition. 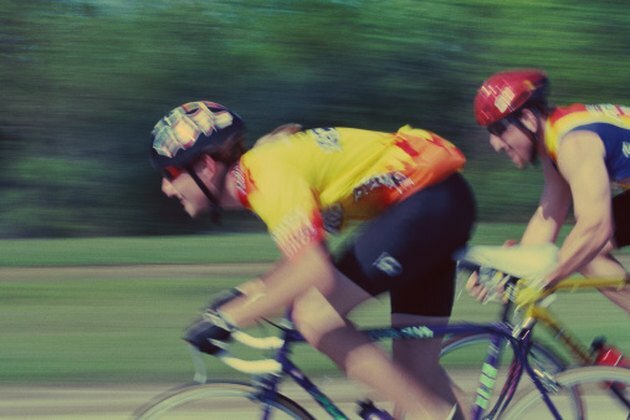 To do this, you must maintain a minimum average speed of about 14 mph during the bike segment.